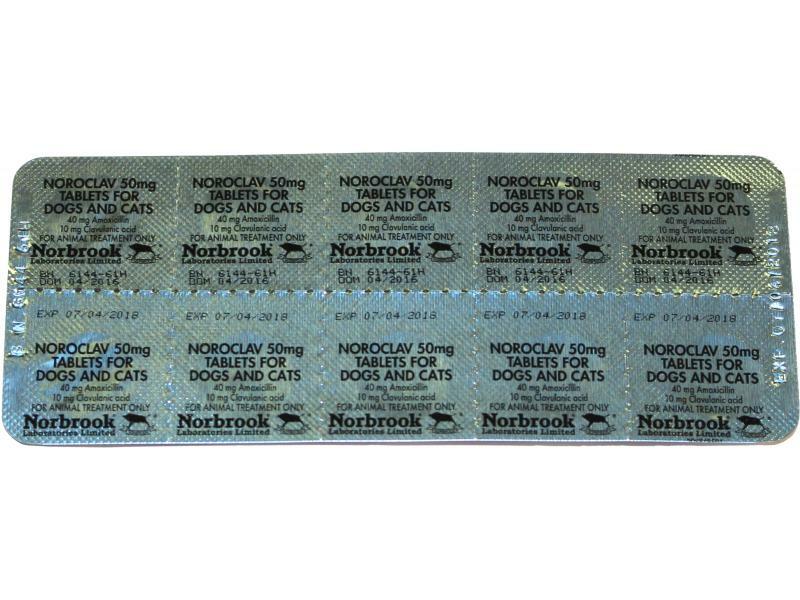 Noroclav Tablets are for use in cats and dogs for the treatment of bacterial infections affecting the respiratory, alimentary and urinary systems and the skin. They can also be used for other soft tissue infections and infected wounds. Noroclav Tablets contain amoxycillin and clavulanic acid which combine together to kill a broad spectrum of different types of bacteria. They are given twice daily by mouth for 5 days or longer as indicted by the type of infection. Round pink biconvex tablet with a score line and 50 embossed on opposing faces. It is recommended to carry out suitable tests for sensitivity testing when initiating the treatment. The treatment should only proceed if sensitivity is proven to the combination. Do not use in animals with known hypersensitivity to penicillin or other substances of the beta-lactam group. Do not use in rabbits, guinea pigs, hamsters or gerbils. Inappropriate use of the product may increase the prevalence of bacteria resistant to amoxicillin/clavulanic acid. In animals with hepatic and renal failure, the dosing regimen should be carefully evaluated. Use of the product should be based on susceptibility testing and take into account official and local antimicrobial policies. Narrow spectrum antibacterial therapy should be used for first line treatment where susceptibility testing suggests likely efficacy of this approach. Caution is advised in the use in small herbivores other than those in section, Contraindications. Dogs and cats diagnosed with Pseudomonas infections should not be treated with this antibiotic combination. Hypersensitivity reactions unrelated to dose can occur with these agents. Gastrointestinal symptoms (diarrhoea, vomiting) may occur after administration of the product. Allergic reactions (e.g. skin reactions, anaphylaxia) may occasionally occur. In case of occurrence of allergic reaction, the treatment should be withdrawn. Studies in laboratory animals have not produced any evidence of teratogenic effects. Use only according to the benefit/risk assessment by the responsible veterinarian. Administration is via the oral route. The dosage rate is 12.5 mg combined actives/kg bodyweight twice daily. The tablets may be crushed and added to a little food. Acute cases: 5 to 7 days of treatment. If no improvement is observed after 5 to 7 days, the diagnosis should be re-assessed. Chronic or refractory cases: In these cases where there is considerable tissue damage, a longer course of therapy may be required so that it allows sufficient time for damaged tissue to repair. If no improvement is observed after two weeks, the diagnosis should be re-assessed. The product is of a low order of toxicity and is well tolerated by the oral route. In a tolerance study in dogs a tested dose of 3 times the recommended dose of 12.5mg of the combined actives administered twice daily for 8 days did not demonstrate adverse effects. In a tolerance study in cats a tested dose of 3 times the recommended dose of 12.5mg of the combined actives administered twice daily for 15 days did not demonstrate adverse effects. Amoxicillin is a beta-lactam antibiotic and its structure contains the beta-lactam ring and thiazolidine ring common to all penicillins. Amoxicillin shows activity against susceptible Gram-positive bacteria and Gram-negative bacteria. Beta-lactam antibiotics prevent the bacterial cell wall from forming by interfering with the final stage of peptidoglycan synthesis. They inhibit the activity of transpeptidase enzymes, which catalyse cross-linkage of the glycopeptide polymer units that form the cell wall. They exert a bactericidal action but cause lysis of growing cells only. Clavulanic acid is one of the naturally occurring metabolites of the streptomycete Streptomyces clavuligerus. It has a structural similarity to the penicillin nucleus, including possession of a beta-lactam ring. Clavulanic acid is a beta-lactamase inhibitor acting initially competitively but ultimately irreversibly. Clavulanic acid will penetrate the bacterial cell wall binding to both extracellular and intracellular beta-lactamases. Amoxicillin is susceptible to breakdown by β-lactamase and therefore combination with an effective ß-lactamase inhibitor (clavulanic acid) extends the range of bacteria against which it is active to include β-lactamase producing species. Resistance is shown among Enterobacter spp, Pseudomonas aeruginosa and methicillin-resistant Staphylococcus aureus. A trend in resistance of E. coli is reported. Amoxicillin is well-absorbed following oral administration. In dogs the systemic bioavailability is 60-70%. Amoxicillin (pKa 2.8) has a relatively small apparent distribution volume, a low plasma protein binding (34% in dogs) and a short terminal half-life due to active tubular excretion via the kidneys. Following absorption the highest concentrations are found in the kidneys (urine) and the bile and then in liver, lungs, heart and spleen. The distribution of amoxicillin to the cerebrospinal fluid is low unless the meninges are inflamed. Clavulanic acid (pK1 2.7) is also well-absorbed following oral administration. The penetration to the cerebrospinal fluid is poor. The plasma protein binding is approximately 25% and the elimination half-life is short. Clavulanic acid is heavily eliminated by renal excretion (unchanged in urine). After oral administration of the recommended dose of 12.5mg combined actives/kg to dogs, the following parameters were observed: Cmax of 6.30 +/-0.45µg/ml, Tmax of 1.98 +/- 0.135h and AUC of 23.38 +/- 1.39 µg/ml.h for amoxicillin and Cmax of 0.87 +/- 0.1µg/ml, Tmax of 1.57 +/- 0.177hrs and AUC of 1.56 +/- 0.24mg/ml.h for clavulanic acid. After oral administration of the recommended dose of 12.5mg combined actives/kg to cats, the following parameters were observed: Cmax of 7.12 +/-1.460 µg/ml, Tmax of 2.69 +/- 0.561 h and AUC of 33.54 +/- 7.335 µg/ml.h for amoxicillin and Cmax of 1.67 +/- 0.381 µg/ml, Tmax of 1.83 +/- 0.227 h and AUC of 7.03 +/- 1.493 µg/ml.h for clavulanic acid. 2 years (blister packs), 6 months (tubs). The product is supplied in high-density polyethylene tubs with a polypropylene screw cap lid containing 100 tablets and in high-density polyethylene tubs with a polyethylene screw cap lid containing 500 tablets. A sachet of desiccant is included in each container. The product is also presented in packs containing 2, 10 and 50 blister strips (aluminium-aluminium) each containing 10 tablets per strip. Pale brown circular tablet with two crossing score lines and embossed with ‘250’ on opposing faces. It is recommended to carry out suitable tests for sensitivity when initiating the treatment. The treatment should only proceed if sensitivity is proven to the combination. The product should not be given to rabbits, hamsters, guinea pigs or gerbils. Do not use in animals with known hypersensitivity to penicillin, other beta-lactams or any of the excipients.Do not use in animals with serious dysfunction of the kidneys accompanied by anuria or oliguria. Use of the product deviating from the instructions given in the SPC may increase the prevalence of bacteria resistant to beta-lactam antimicrobials and may decrease the effectiveness of treatment with other classes of antimicrobials due to the potential for cross resistance. Official and regional antimicrobial policies should be taken into account. Caution is advised in their use in small herbivores. The chewable tablets are flavoured. In order to avoid any accidental ingestion, store tablets out of reach of animals. Penicillins and cephalosporins may cause hypersensitivity (allergy) following injection inhalation, ingestion or skin contact. Hypersensitivity to penicillins may lead to cross reactions to cephalosporins and vice versa. Allergic reactions to these substances may occasionally be serious. Hypersensitivity reactions to penicillins may occur in treated animals. Allergic reactions (e.g. skin reactions, anaphylaxis) may occasionally occur. In case of occurrence of allergic reaction, the treatment should be withdrawn. Very rarely (less than 1 animal in 10,000 animals treated, including isolated reports), use of the product may result in gastro-intestinal disorders (vomiting, diarrhoea, anorexia). Administration: by the oral route. Dosage rate: total 12.5 mg of combined actives/kg bw. (equal to 10 mg of amoxicillin + 2.5 mg of clavulanate/kg bw). Dosage frequency: The following table is intended as a guide to dispensing at the standard dose rate of 12.5 mg/kg bw, twice daily. If the dog or cat does not accept the tablet from hand or bowl, then the tablets may be crumbled and added to a little food. The majority of routine cases respond after between 5 and 7 days therapy. If no improvement is observed after 5 – 7 days, the diagnosis should be re-assessed. In chronic or refractory cases, a longer course of therapy may be required e.g. chronic skin disease 10 - 20 days, chronic cystitis 10 - 28 days, respiratory disease 8 - 10 days. Symptomatic treatment should be initiated when necessary.Mild gastrointestinal symptoms (diarrhoea, nausea and vomiting) may occur more frequently after overdose of the product. Pharmacotherapeutic group: Beta-lactam antibacterials, penicillins. Resistance is shown among Enterobacter spp, Pseudomonas aeruginosa and methicillin-resistant Staphylococcus aureus. A trend in resistance of E. coli is reported. Acquired resistance prevalence may be high in E. coli. Resistance notably develops through the production of inhibitor-resistant beta-lactamases or the hyperproduction of beta-lactamases. In some strains of Staphylococcus aureus (methicillin-resistant S. aureus, MRSA), and of Staphylococcus pseudintermedius, resistance to all beta-lactams is conferred by the alteration of the cell wall target proteins (Penicillin-Binding Proteins). This is often associated to resistance to multiple other antimicrobial compounds with cross resistance. Pseudomonas aeruginosa and Enterobacter spp. can be regarded as intrinsically resistant to the combination. After oral administration of the recommended dose of 12.5mg combined actives/kg to cats, the following parameters were observed: Cmax of 9.17 µg/ml and AUC of 53.27 µg.h/ml for amoxicillin and Cmax of 2.32 µg/ml, and AUC of 13.33 µg.h/ml for clavulanic acid. After oral administration of the recommended dose of 12.5mg combined actives/kg to dogs, the following parameters were observed: Cmax of 8.92 µg/ml and AUC of 46.29 µg.h/ml for amoxicillin and Cmax of 2.21 µg/ml, and AUC of 8.99 µg.h/ml for clavulanic acid. Shelf-life of the veterinary medicinal product as packaged for sale: 1 year. Discard any unused halved tablets immediately. Blisters (aluminium/aluminium): 20, 50, 200, 250 and 500 tablets in outer packages with blister strips containing 5 tablets each. Noroclav 250 mg Chewable Flavoured Tablets for Cats and Dogs (ROI [RMS], AT, BG, CY, HU, IT, EL, LV, LT, PL, RO, SK, SE, UK). Noroclav 200 mg/50 mg Chewable Flavoured Tablets for Cats and Dogs (CZ). Veclavam 250 mg Chewable Flavoured Tablets for Cats and Dogs (BE, ES, LU, NL, PT). Veclavam Flavour Vet. 200 mg/50 mg Tablets for Cats and Dogs (DK). Veclavam P 250 mg Chewable Tablets for Cats and Dogs (FR). Veclavam vet (NO). Chewable Tablet. Pale brown circular tablet with two crossing score lines and embossed with ‘250’ on opposing faces. The tablets can be divided into equal halves. The product should not be given to rabbits, hamsters, guinea pigs or gerbils. Do not use in animals with known hypersensitivity to penicillin, other beta-lactams or any of the excipients.Do not use in animals with serious dysfunction of the kidneys accompanied by anuria or oliguria. Do not use where resistance to this combination is known to occur. Do not administer to horses and ruminating animals. Whenever possible, the product should only be used based on susceptibility testing. Use of the product deviating from the instructions given in the SPC may increase the prevalence of bacteria resistant to beta-lactam antimicrobials and may decrease the effectiveness of treatment with other classes of antimicrobials due to the potential for cross resistance. Penicillins and cephalosporins may cause hypersensitivity (allergy) following injection inhalation, ingestion or skin contact. Hypersensitivity to penicillins may lead to cross reactions to cephalosporins and vice versa. Allergic reactions to these substances may occasionally be serious. Do not handle this product if you know you are sensitised, or if you have been advised not to work with such preparations. Handle this product with great care to avoid exposure, taking all recommended precautions. If you develop symptoms following exposure such as a skin rash, you should seek medical advice and show the doctor this warning. Swelling of the face, lips or eyes or difficulty with breathing, are more serious symptoms and require urgent medical attention. Wash hands after use. Hypersensitivity reactions to penicillins may occur in treated animals. Allergic reactions (e.g. skin reactions, anaphylaxis) may occasionally occur. In case of occurrence of allergic reaction, the treatment should be withdrawn. Very rarely (less than 1 animal in 10,000 animals treated, including isolated reports), use of the product may result in gastro-intestinal disorders (vomiting, diarrhoea, anorexia). Chloramphenicol, macrolides, sulfonamides and tetracyclines may inhibit the antibacterial effect of penicillins because of the rapid onset of bacteriostatic action. The potential for allergic cross-reactivity with other penicillins should be considered. Penicillins may increase the effect of aminoglycosides. 4.9 Amounts to be Administered and Administration Administration: by the oral route. Dosage rate: total 12.5 mg of combined actives/kg bw. (equal to 10 mg of amoxicillin + 2.5 mg of clavulanate/kg bw). Dosage frequency: The following table is intended as a guide to dispensing at the standard dose rate of 12.5 mg/kg bw, twice daily. To ensure a correct dosage, bodyweight should be determined as accurately as possible. If the dog or cat does not accept the tablet from hand or bowl, then the tablets may be crumbled and added to a little food. The majority of routine cases respond after between 5 and 7 days therapy. If no improvement is observed after 5 – 7 days, the diagnosis should be re-assessed. In chronic or refractory cases, a longer course of therapy may be required e.g. chronic skin disease 10 - 20 days, chronic cystitis 10 - 28 days, respiratory disease 8 - 10 days. If no improvement is observed after two weeks, the diagnosis should be re-assessed. Gram-negative: Escherichia coli (including most b-lactamase producing strains) Pasteurella spp Proteus spp Resistance is shown among Enterobacter spp, Pseudomonas aeruginosa and methicillin-resistant Staphylococcus aureus. Dogs and cats diagnosed with Pseudomonas infections should not be treated with this antibiotic combination. A trend in resistance of E. coli is reported. Acquired resistance prevalence may be high in E. coli. Resistance notably develops through the production of inhibitor-resistant beta-lactamases or the hyperproduction of beta-lactamases. In some strains of Staphylococcus aureus (methicillin-resistant S. aureus, MRSA), and of Staphylococcus pseudintermedius, resistance to all beta-lactams is conferred by the alteration of the cell wall target proteins (Penicillin-Binding Proteins). This is often associated to resistance to multiple other antimicrobial compounds with cross resistance. Pseudomonas aeruginosa and Enterobacter spp. can be regarded as intrinsically resistant to the combination. Below are some recent questions we've received regarding Noroclav Tablets, including answers from our team. If your dog will not accept the tablets whole then it would be best to crumble it and mix it in with food. This is a good product for UTI, though culture and sensitivity is still best to do first if possible. can 3 week old puppy have Noroclav ? Yes if there is sufficient reason to believe that antibiotic is needed, then this is generally a safe and effective one to choose.